The next meal from Donna Hay’s Flavors was Asian influenced and came from the chilli chapter. Her chilli rice paper rolls and chilli tofu in coconut broth both looked so irresistible I had to give them a try. I’ve been candid about my inabilities in the realm of preparing Asian cuisine, so I treaded cautiously into these recipes. I took my time, made sure I mostly followed the instructions, and guess what? Everything turned out fine. Better than fine. 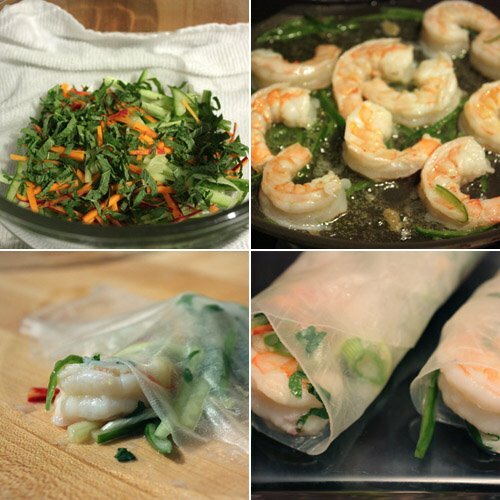 These shrimp rolls were definitely the best I’ve ever made. That’s not saying much, but the chilli salad filling in these rolls was really fantastic. Shrimp was sauteed with ginger and thinly sliced chillis which were supposed to be red. Oddly enough, there were no red chillis, which I usually spell chiles but I’m going with the spelling used in the book, at the store so I used green. The salad filling consisted of very thinly sliced green onion, cucumber, mint, lime juice, and fish sauce. Because the chillis were green, and everything else in the salad was green, I added some tiny carrot matchsticks just to contribute a little color variety. The mixture was tart, fresh-tasting, and crunchy. For a dipping sauce, I used soy sauce with some green onion and ginger. 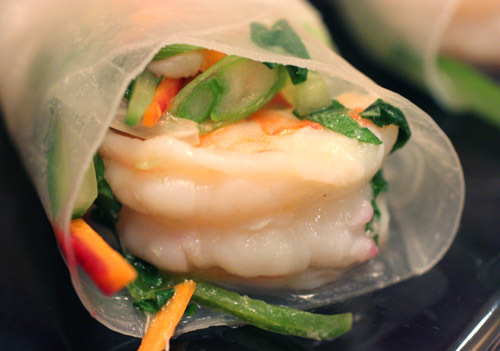 The rolls can sit in the refrigerator covered with a damp towel, so advance preparation is a definite possibility. We didn’t have leftovers, so I don’t know what they would be like after overnight refrigeration but a few hours would be fine. 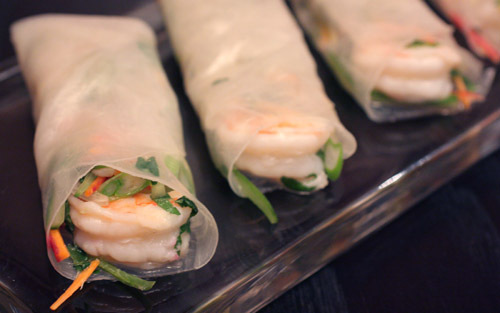 The cool, crisp lightness, the combination of salty and spicy flavors, and the fresh, sweet shrimp made these addictive. And, then they were gone, and I’m already craving them again. The time had come for a meal with a little meat in it, or chicken, but that’s still meat, so I set about browsing through books for inspiration. I pulled Donna Hay’s Flavors from the shelf and once again realized how really interesting and appealing everything in that book is. There are nine chapters in the book and each is devoted to a particular flavor. It shows particular flavors used in very different preparations, and it makes you stop to consider what basic tastes work with one another. 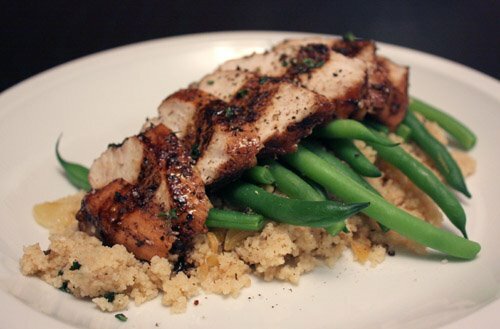 This balsamic chicken with garlic couscous dish is from the garlic and onion chapter. The chapter begins with a quick discussion of types of onions and garlic and some basic preparations, and then each recipe has an accompanying photo of the delectable-looking food. It was difficult to decide which meal I wanted to try, and I ended up making a few things from the book over the course of a couple of days. I’ll be posting the other items soon. 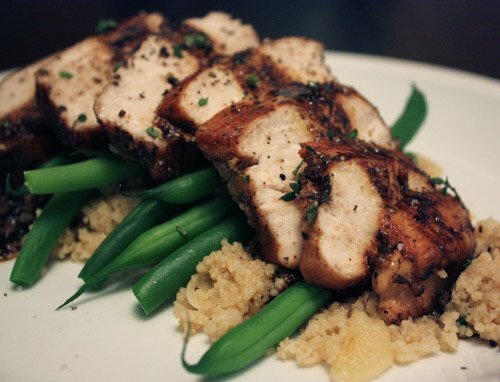 The balsamic chicken was started by marinating boneless chicken in balsamic vinegar, chicken stock, crushed garlic, and sugar. I tend to greatly reduce or entirely skip the sugar in recipes when it’s intended to balance acidity because I like a little tart spunkiness. Two tablespoons of sugar seemed excessive at any rate, so I only used about two teaspoons. The less sweet marinade did its work for 20 minutes while garlic was sliced and green beans were cleaned. I used whole wheat couscous which was cooked with chicken stock. The chicken breasts were sauteed on each side before the marinade was poured into the pan. It finished cooking through as the marinade thickened into a sauce. To finish the couscous, sliced garlic and thyme were sauteed in a little butter and the cooked couscous was stirred into that mixture. Kurt commented on the couscous being the best ever, and I let him know that it could be because of the half a stick of butter in it. I re-read the ingredient list a couple of times and did the weight to volume conversion a few more times to be sure, two ounces equals four tablespoons, but yes, it was half a stick of butter. It was worth it. The couscous was fantastic, and the chicken was just as delicious as it looked in the book. The marinade thickened nicely into a sauce, and it left the chicken flavorful and tender. The garlic, both raw in the marinade and butter sauteed to savory wonder in the couscous, added character to the meal as it always does. This meal was a winner from Donna Hay, and there’s more of the same throughout the book. 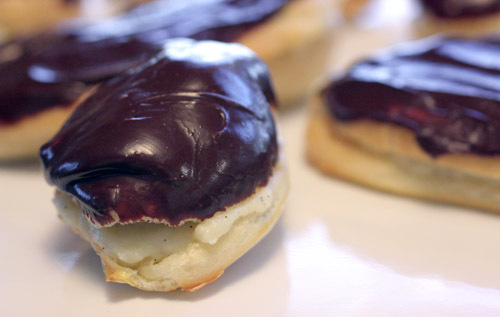 I had made pate a choux, vanilla pastry cream, and chocolate glaze before, but I had never made them all at the same time in the form of an eclair. I decided it was high-time I do so, and I grabbed Wayne Harley Brachman’s Retro Desserts for a recipe to follow. I’ve had this book since it first came out in 2000, and it’s full of fun, well-known desserts with everything from cakes and pies to ice creams and candies. The book is described as bringing together kitsch desserts for today’s kitchens and letting you make your remembered favorites entirely from scratch. The cream-filled devil’s food cupcakes bring back Ho Ho’s. I’ve never had cherries jubilee, but it’s in the book too. I’ve made the banana pudding which was fantastic, and I’ve always wanted to try the banana peanut butter sandwich cake. Then, there’s the rocky road pizza pie and the white-chocolate grasshopper pie to try. I could go on and on, but I was explaining about the eclairs. I’ve named this post Practice Eclairs because these were so far from perfect. In fact, they were so ugly only their mother could love them. When it came time to pipe the dough into eclair shapes, I rather failed at the task. They ended up too wide and too flat and didn’t puff up enough to make them look any better after baking. I also made a few minis which were kind of cute, and I would love to make an entire batch at that small size. The mini version is shown at the top of the post. Making the pate a choux was easy enough. I’ve made Ina Garten’s gourgeres, and her technique involves a food processor to incorporate the eggs. Brachman suggested using an electric mixer which also worked fine, and either method is much easier than stirring in each egg by hand. So, making pate a choux is no problem; piping it into appropriate shapes still needs work. The vanilla pastry cream was also not a problem. I’ve followed the recipe in this book several times, and it always turns out great. 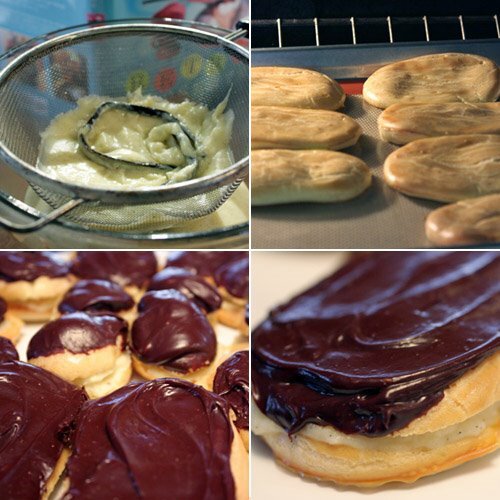 For filling the eclairs, this recipe suggests slicing the top off each one, pulling out some of the interior dough, and spreading the pastry cream on the bottom piece. Then, the top pieces were dipped in the chocolate glaze and set aside to dry. Tops found bottoms, and they were done. Slicing the eclairs to fill them, instead of hollowing them with a skewer and then piping in the filling, seemed like cheating. I think it also contributed to their unsightliness. However, the look of them stopped mattering as soon as I tasted them. Freshly made eclairs are a wonderful thing. The pastry cream made with a vanilla bean had incredible flavor, and the chocolate glaze with espresso was amazing. 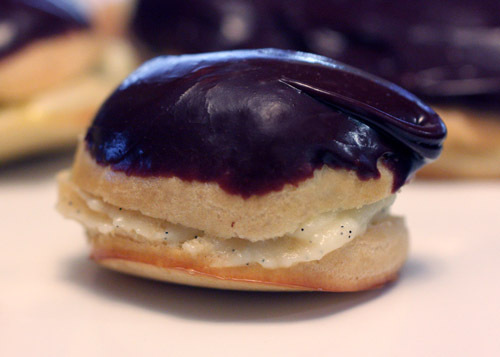 I want to try again and do a little better job of piping the dough into eclair shapes. And, I want to try some other recipes to compare and contrast and fill them without slicing, but deliciousness won out over ugliness with these for certain. This is one more dish from last month’s La Cucina Italiana, and then I promise to move on and cook other things. Orzo in the title is Italian for barley rather than the name for rice-shaped pasta. Barley must be the new lemon because I've been using it so much in one month. 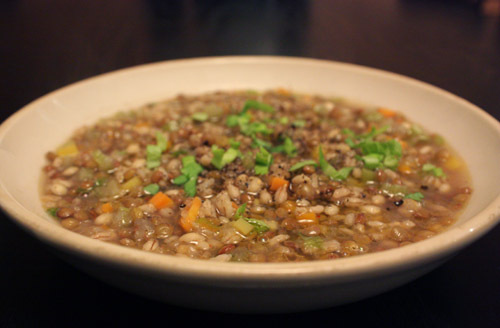 Lenticchie are lentils, which I love year round, but they are especially perfect in this wintry soup. I didn’t find the castelluccio or colfiorito lentils recommended in the recipe, so I used the basic brown lentils, the origins of which I don’t know, from the bulk section at Central Market. Onion, carrot, and celery were sautéed in a large skillet before the barley, lentils, and white wine were added. That combination cooked until the wine was reduced to almost nothing, and then vegetable broth was added and allowed to simmer. Scooped into bowls and anointed with olive oil, it was served with a few chopped celery leaves on top. Sitting down to a meal of soup sounds less than hearty, but this particular soup will surprise you. It retains some broth, but the barley absorbs quite a lot of the liquid. So, even though it’s not creamy or blended, it feels like a thick soup. One small bowl was enough for me to feel full and happy. 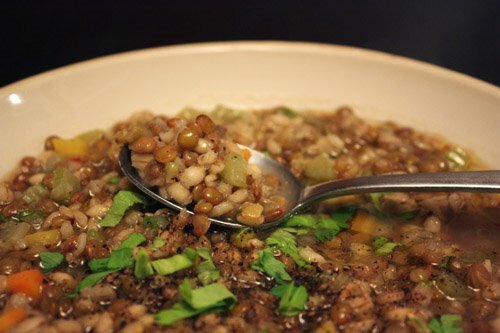 It’s a simple meal, but the chewy barley and tender lentils in the hot flavorful broth are unbelievably filling and satisfying. Clearly December was a good month for food magazines, because I’ve been cooking all kinds of things from them. From Eating Well, I made the roasted fall vegetables in a cheddar crust and quite enjoyed it for dinner one night. Unfortunately, Kurt was less than thrilled with the meal, found it a bit dry, and asked what I’d done with the steak he would have preferred. I would have overruled his opinion and posted the roasted vegetable tart if only I had continued to like it the next day. When I re-heated a piece for lunch, I had to admit, he might be right. It was a little dry and failed to impress. However, the storm of vegetables didn’t stop there. 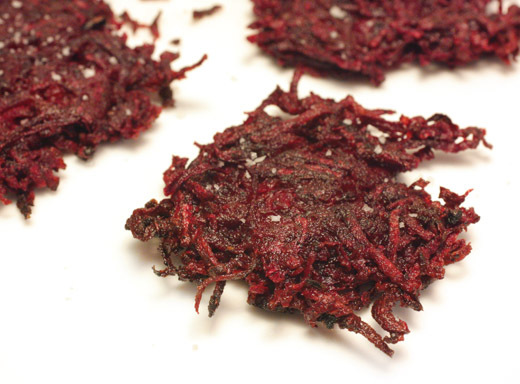 I also made the shredded root vegetable pancakes from Eating Well, and these received high marks all around. I made the pancakes with red and yellow beets, and for those who believe beets are not to their liking, I implore you to try them this way. It’s pretty much a latke only made with your choice of root vegetables instead of potatoes. The interesting thing about shredding beets is that there is much less liquid than there is when shredding potatoes. They don’t have to be drained or squeezed or anything. 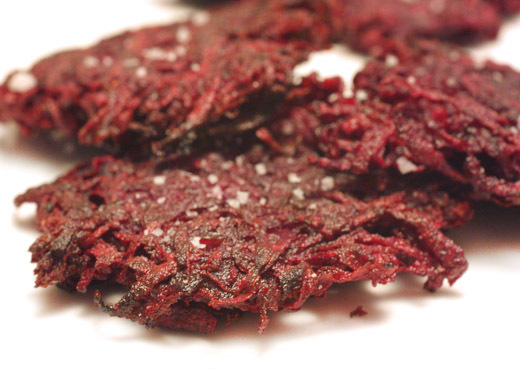 The mixture included horseradish which is absolutely perfect with beets. I skipped the bacon, but that would add some savory appeal if you’re so inclined. I didn’t even top these with sour cream; they just received pinches of chopped dill and sea salt. I haven’t checked the records yet, but I believe this was the shortest amount of time in which five medium beets have ever been consumed. The crunchiness and earthy, sweet flavors punched up by the horseradish and dill got a thumbs-up from Kurt, and he didn't even lament the lack of meat. The December issue of La Cucina Italiana seemed to have been written just for me. Page after page, every dish was something I wanted to eat. When I first read the issue, I immediately made the ribollita which was delicious topped with fontina. Last weekend, I tried a couple of other meals from an article about hearty, festive, holiday season dishes from the northern, alpine region of Italy. The first was spiedini rustici con salsiccia. I used chicken, hot Italian sausage, but that was my only change to the instructions provided. 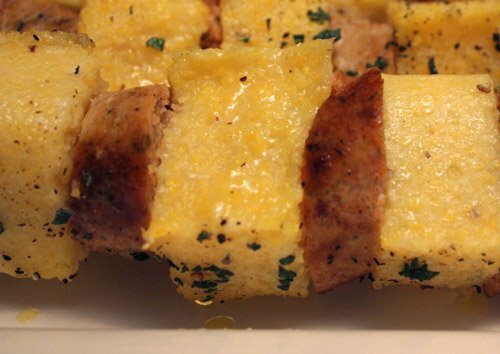 Polenta was cooked and allowed to cool in a loaf pan before being cut into skewerable pieces. The sausage was browned on top of the stove and then sliced. 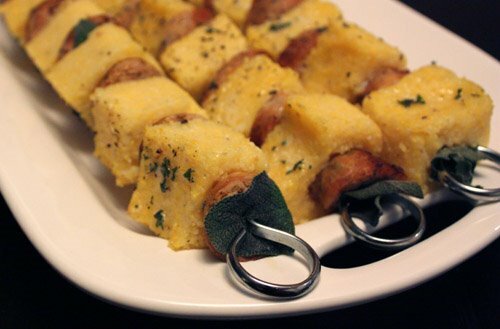 The spiedini were built with alternating pieces of sausage and polenta with sage leaves on the ends. Then, and this is the important part, they were dotted with butter before being heated through in the oven. So, think for a moment if anything bad ever results from dotting something with butter before placing it in the oven? I don’t think it does. These spiedini are as simple as it gets, but the butter made them something special. I added a touch of chopped sage with a sprinkling of black pepper before serving. As I made these, I was thinking about how spiedini make good party food. 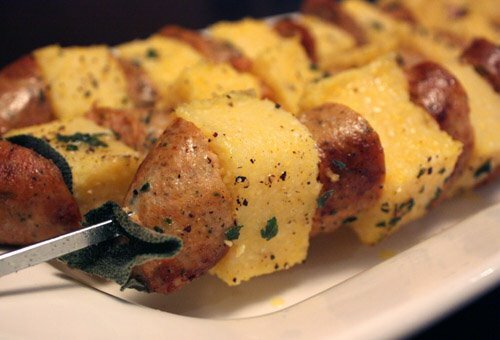 Smaller versions of these, with just one small slice of sausage and a smaller chunk of polenta, would make great hors d’oeuvres. I’ve served a similar mini spiedini before using rosemary sprigs as skewers. Full size or miniature, be sure to dot with butter for rich flavor and nice bits of crust on the polenta. I’ve heard from a few sources that the best tart crust is found in the Zuni Cafe Cookbook , so I gave it a try with the open-faced apple tart which is also in the book. First, I should explain that this book contains a lot of insightful information with each recipe. There are introductions explaining reasons behind the ingredients and techniques and very detailed instructions. It’s clear that Judy Rodgers really cares about food and is keenly interested in passing on her expertise. There’s a lot to learn in this book, and I enjoy re-reading sections each time I use it. For the basic rich tart dough, Rodgers begins by explaining her use of salted butter. Salted butter? Yes. She prefers a salted butter with 90 milligrams of sodium per tablespoon for the crispy pastry and rich flavor it produces. I used Kerrygold pure Irish butter, because I’m now infatuated with Irish butter, and it contains 105 milligrams of sodium per tablespoon. Close enough. This basic tart dough involves working the butter and flour together with no water. This technique is simple but different from other recipes I’ve followed. The butter is cut into ¼ inch pieces and flipped in the flour to coat. Then, the pieces of butter are pinched with your fingers to make shards and cupped shapes. You continue working the butter and flour with your fingers until the butter breaks apart allowing it all to come together to form a dough. This happened very easily, and the dough was chilled in plastic to let the glutens relax. I left the dough between sheets of plastic wrap, rolled it out without adding more flour, fit it into a tart pan, and set it in the freezer for about an hour. 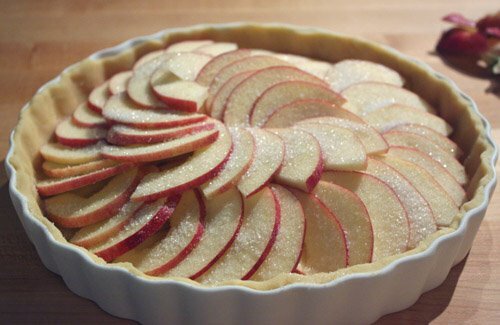 To fill the tart, cored, halved apples were thinly sliced cross-wise. I used organic Galas and overlapped the slices in a spiral shape. Then, salt makes another appearance. The surface was sprinkled with a couple of pinches of salt to help bring out the fruit’s flavor, Rodgers explains. Sugar was sprinkled over as well. The tart baked for 40 minutes, and I brushed on a honey glaze when it was cool. The simpler the ingredient list, the more perfect each item needs to be. The apples were crisp and sweet, and the delicious, salted butter worked its magic. The crust was a little thin, so I’ll use a smaller pan next time, but that was my only complaint. The tart tasted of apply apples and buttery butter which may sound silly but that’s the best I can do. The flavors are very straightforward but magnified and better than ever. 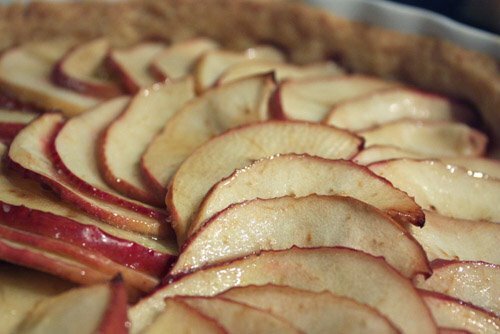 Try salted butter and try adding a pinch or two of salt over apples in this tart, and enjoy the really surprisingly elevated flavors that result. I read a fair amount of food writing (slight understatement), and I know I saw something about pickling this or that in Food and Wine at some point. And, there was an article about preserving vegetables in olive oil in La Cucina Italiana which isn’t pickling but had me thinking preservation at any rate. I also have several different cut out pages filed away about quick pickling and the like. All of that got mushed together in my head and when I picked up our CSA vegetables last week, the idea of pickling was on my mind. Well, the kind fellow from Hands of the Earth helped me bag up my portion and made a joke about everyone getting tired of the daikon radishes. I said something about I didn’t mind them, and then he said “you should pickle them.” Yes. 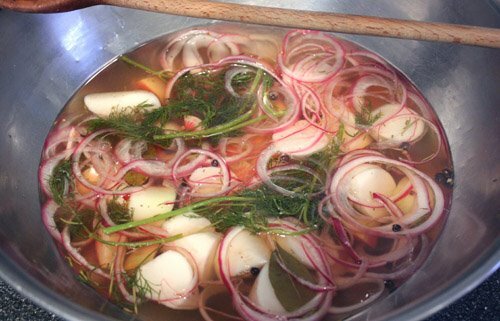 I’d been thinking about pickling, and that cemented it. 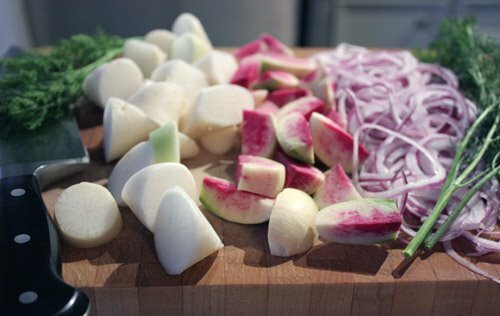 The radishes are crisp, vinegary, salty, and addictive. They’ll be great offered up with some olives and cornichons or on the side with a salad. Coming to think of it, I have a thing for veggie burgers and eating little briny bites like olives and pickles with them. 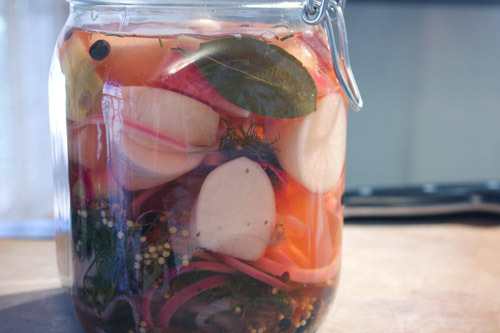 Pickled radishes and veggie burgers may become a new favorite pairing. Note: After a few days in the refrigerator, everything in the jar has turned pink due to the watermelon radishes. The initial, multi-colored look was nice, but pink is pretty too, and it tastes just as good. While looking through my filed, old magazine pages, I re-discovered this meal which I think came from Living magazine in 1998. The issue date is not printed on the page, and I couldn’t find this recipe on the web site, but an ad on the back of the page has a 1998 copyright date. 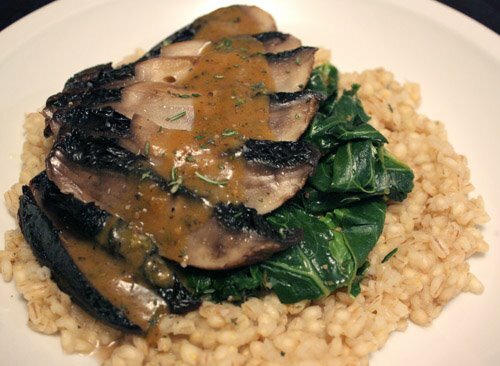 And, that concludes my research into the origins of seared portobello and mixed greens over barley pilaf. In the magazine, it was made with chard, but I used a mix of braising greens from my CSA. This is, indeed, one of those grainy, healthy, vegetarian types of meals, but sometimes that’s just what I want. 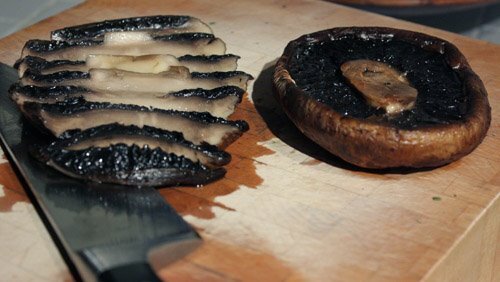 Even though it is very healthy, the portobellos lend a savory meatiness, and barley is a hearty, chewy grain, so the meal doesn’t feel lacking or too light. Also, the sauce provides extra flavor and just a hint of richness. 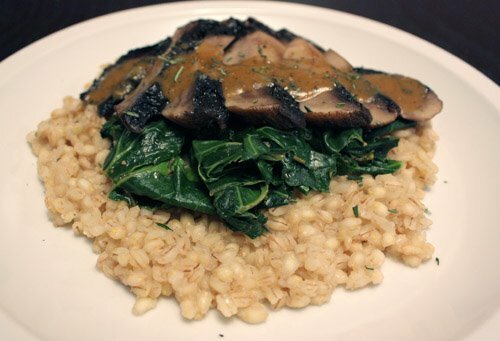 Barley is a natural fit with mushrooms to my mind, and the greens joined in well. The flavors were earthy and wintery with the rosemary accent, the sauce had a nice depth, and the butter, of course, made all the difference. This healthy meal was quick to prepare and disappeared from our plates even more quickly. I believe this whole meal started with a crisp, fresh head of green cabbage. We only have one more pick-up in our fall/winter CSA subscription, and I’m trying to make good and interesting use of these vegetables. 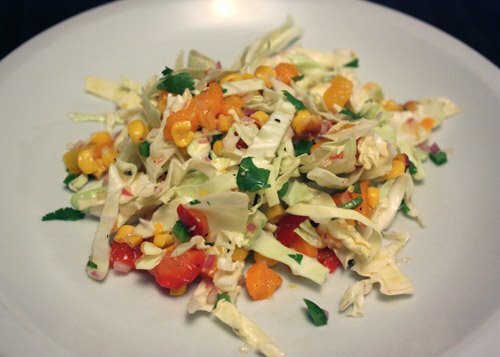 I remembered a jalapeno corn slaw from Robb Walsh and David Garrido’s Nuevo Tex-Mex , and that inspired another look through that fantastic, little book. This book includes everything from drinks to desserts, and it never disappoints. There are salsas, sauces, enchiladas, huevos, tacos, appetizers, rice variations, and sweets. 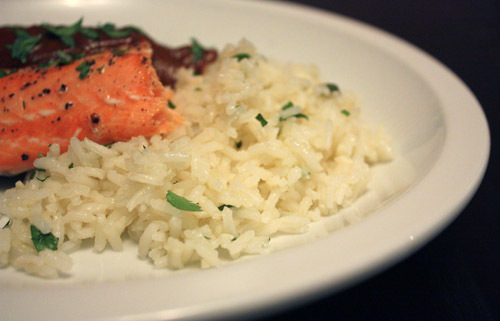 To make a light meal with the slaw as a side, I was thinking of roasted salmon with a spicy sauce and maybe some simple but flavorful rice. I’ll post more about the slaw later, and today I’ll show the Ancho-Tomatillo Sauce and Mexican Mint Marigold Rice that I chose. 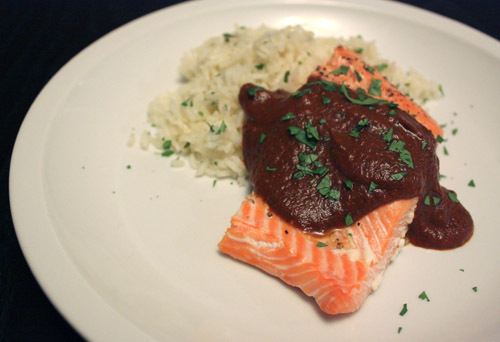 I realize the sauce looks mole-like, and I just prepared a mole a couple of weeks ago, but it’s different, it really is. First, this is much less involved. Onion, garlic, tomatillos, anchos, guajillos, and serranos are sautéed together with some broth and lemon juice. Once the dried chiles are somewhat reconstituted, all is pureed with cilantro and strained. The sauce is then re-heated in olive oil and seasoned to taste. I usually skip straining, but I’m glad I did it here. The sauce became velvety smooth, and the last re-heating with oil step made it even more so. The complex spice and sweetness and the layers of mole flavor are not part of this sauce. Instead, this sauce is more of a punch of piquant chile heat, rounded earthy chile flavor, with slight tangy undertones. 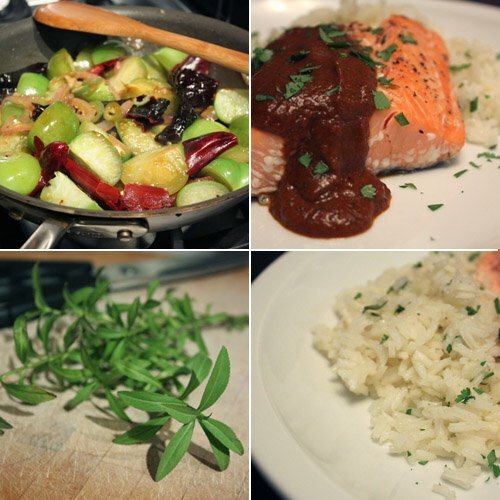 The resulting dish was all about the sauce with the roasted coho salmon serving merely as a delivery system for it. A lighter fish would have disappeared all together, but the salmon performed adequately. The spicy sauce required a quiet, calming companion like rice, and the Mexican mint marigold variation was lovely here. Mex. mint marigold, tagetes lucida, is an herb that grows easily here in Texas with an anise scent and flavor. Tarragon doesn’t fare so well in our heat and humidity, so it makes a very good substitution. It’s a low-maintenance, compact, perennial and produces little, yellow flowers in the fall. 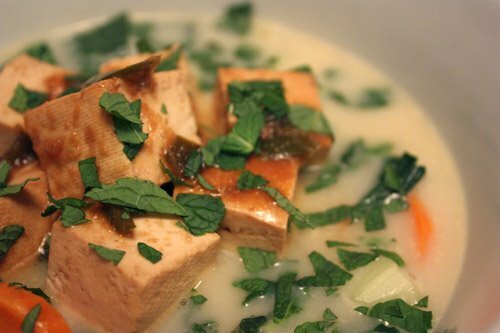 Its slender leaves are easily pulled from its stems, and a tablespoon of chopped leaves were added to the finished rice. First, onion, garlic, and chopped serrano were sautéed with the rice before water and butter were added. That adds a lot of flavor and a near nuttiness, and sautéing the rice in oil prevents the grains from sticking together once cooked. 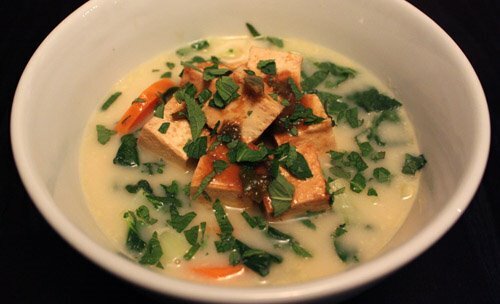 Tossing in the chopped herb added a subtle bit of freshness and barely there anise. 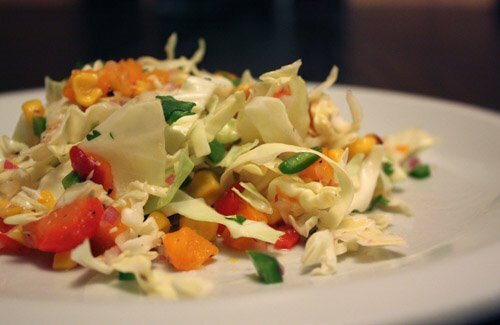 In the end, I got what just I wanted: big flavor, some serious spicy heat, an interesting rice dish, and cool, refreshing, crunchy slaw, all in a light meal. Happy in the Kitchen by Michel Richard has been a delight to read and to explore. The gorgeous, exciting food is fun to read about, and it’s interesting to learn the techniques that made it all possible. Richard’s approach to food is to consider variations beyond classic preparations. With each ingredient, he explores what new and different things it can do or become. For him there is always something to discover, and that’s what inspires him as a chef. The most interesting thing about this book is that despite the jaw-dropping look of the food, the preparations are all pretty simple. That was his intent: to present these new and different ideas that are not difficult to make. 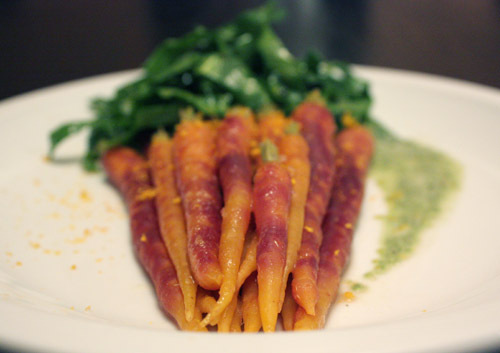 So, with some incredibly fresh and beautiful red carrots from Hands of the Earth Farm, I set about creating Richard’s braised carrots with carrot-top sauce. I know, it’s a plate of carrots. But, wait. 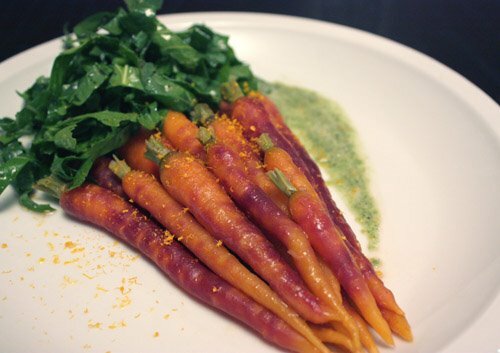 It’s a plate of perfectly tender, braised carrots with a mind-blowingly delicious sauce and a simply dressed salad. This is a must-try dish for the carrot-top sauce alone. The preparation began with chopped onion sauteed with butter. Then coriander, orange juice, and salt were added along with the carrots. That combination simmered for a few minutes. Chicken broth was to be added but I had none and used water instead. Water worked fine. After adding the water, the simmering continued for another 15 minutes. Meanwhile, the leaves were removed from the carrot stems, and then they were blanched, shocked, and squeezed dry. When the carrots reached a state of desired doneness, the remaining sauce was added to the blanched carrot leaves. Those were pureed with additional butter. Seasoning was adjusted. A quick salad was to be made of mache, but I used chopped baby spinach and arugula instead. The chopped spinach and arugula were tossed with red wine vinegar and olive oil. The bunch of carrots scene was achieved with the leaf-like salad situated at the top of the plate with the whole carrots below which were sprinkled with dried orange zest. The sauce was spooned alongside the carrots. One minor concern was that my sauce wasn’t quite as bright green as that in the book, but it was so good I didn’t worry about the color for long. I served this as a shared first course, so all the carrots were positioned together on one plate. 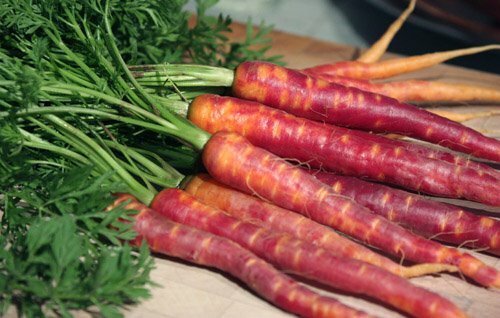 The carrots’ orange juice-braised sweetness was balanced by the acidity of the vinaigretted salad. The butter-rich sauce with the savory onion and bright carrot leaf flavors was an unbelievably nice component. After seeing this dish in the book, I knew there would be visual appeal, but I had no idea how flavorful it would be. As soon as we tried it, the cuteness and wit of the dish became completely secondary to taste and textures and just plain deliciousness. It was intriguing enough to try and so enjoyable it’ll definitely be made again. Every item presented in the book looks like a similar win-win situation, and I’ll be trying more of them soon. The planning, shopping, and cooking for Christmas ended with splendid indulging and leftovers for a few days. Indulging continued on through New Year’s week, but I was no longer cooking. While visiting family, I got to sit back, relax, and catch up on magazine reading. Is there anything better than not setting an alarm for several days, getting to sit and read without even needing to glance at a clock from time to time, and knowing someone else is making dinner today? Well, that last one is nice once in a while. I spotted this roasted squash salad in the December issue of Bon Appetit which I lazily read right after finishing Saveur and just before picking up Eating Well. Rough week. The combination of flavors sounded great, and it looked like a meal in itself. The peeled butternut squash was thinly sliced and roasted with a glaze of balsamic vinegar and a scant bit of brown sugar. The remaining ingredients were simply arranged on the plate. The one change I made was using pears instead of apples. 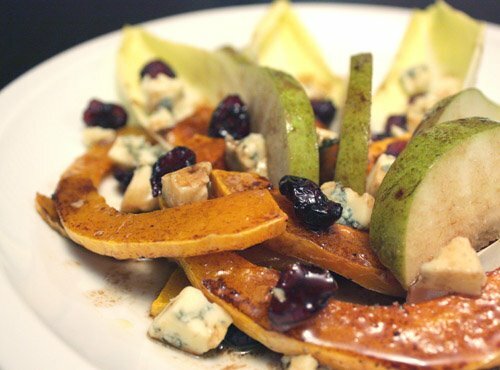 Endive spears were fanned about, pear slices were interspersed, the roasted squash was mounded nearby, and dried cranberries and blue cheese crumbles were spilled atop it all. The plated salad received a drizzling of balsamic and lemon vinaigrette. It was simple and lovely, and tasted as good as I knew it would when I sat idly reading about it a few days ago. What culinary challenges and delights will 2009 hold? Which filed-away recipes will finally be attempted this year? What classics will I ruin beyond all recognition? I have no idea. I really want to make a sourdough starter. I want to make tamales in my own banana leaves. I want to make ice cream too. And, I have a stack of new books waiting to inspire all sorts of new dishes.